What Goodreads Says An evocative and compelling story of two sisters who would do anything for each other—perfect for fans of Thirteen Reasons Why and Speak. Joy Preble's stirring new novel explores the lengths to which sisters go to protect each other, and the winding road that brings two strangers into each other's lives. What I Say I say brava Joy Preble. This was a surprisingly emotional novel. I didn't cry, it wasn't like that. It covers a pretty heavy topic and you're not sure about it till the very end. Leo and Paris Hollings have never really had a home. They've moved around with their mother since they were kids until she married their stepfather, Tommy, and moved to Vegas. Neither of them really likes it there, they miss living in Los Angeles but they stick together and make do. Leo and Paris go out for pie late one night where Leo meets a boy named Max. When Paris goes out to the car to get something, she never comes back. She leaves a note for Leo to find her which sets up the rest of the story. Leo and Max go on this adventure to find Paris. It brings them to the top of the Stratosphere, to the Paris Hotel and even Los Angeles. You learn a lot about Leo and Paris but also Max. Is it a joke that Paris is playing on Leo or is it something more serious? You learn fairly quickly that Leo and Paris have a rather dysfunctional family life. Their mom isn't particularly motherly and Tommy has a quality about him you just don't like. Without giving too much away, the heavy topic that the story is centered around is sexual abuse. You have suspicions early on but you're never 100% sure what's really happening. When you get to the end and everything is uncovered, you go through a tidal wave of emotions: anger, hurt, sympathy, anger again and disbelief. How can people do something so terrible? Why do people have to go through something like this? How do people get away with something like this? Joy lightens it up by taking you on Leo and Max's journey to find Paris. They learn about each other and you get to go on a road trip with them. That suspicion is always weighing in the background but it only comes up a few times. I think that Joy did a great job writing a story that was fun to read while covering a topic that needs to be discussed. Finding Paris was a lot of fun to read. I didn't start dozing off once! I loved the bond between Leo and Paris. They would literally do anything for each other and I find that amazing. I'm an only child so when I read about such strong sibling relationships, I get a little envious. I always wanted both an older brother and sister but that's a story for another day. 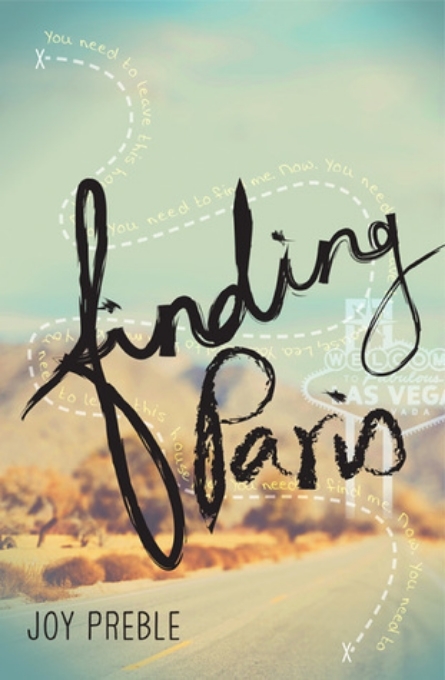 Finding Paris is a great novel. I love the touch of mystery and adventure with a little romance intertwined. Total PG stuff here people, nothing crazy at all. Think Jamie and Landon in A Walk to Remember. Take this to the beach this summer for an easy but really great read. I don't think you'll be disappointed. I give it five stars.